Genevieve Hiett, 89, of Monmouth, Illinois, passed away at 6:10 A.M. on Sunday, January 27, 2019, at Roseville Nursing and Rehab in Roseville, Illinois. She was born on January 15, 1930, in Monmouth, Illinois, the daughter of John and Martha (Jewell) Hillen. 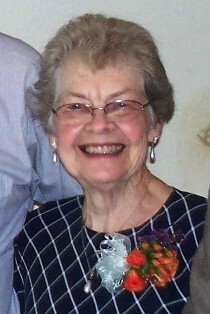 She attended schools in Monmouth and graduated from Monmouth High School with the Class of 1948. She later attended Western Illinois University, where she graduated with a degree in home economics. On November 24, 1950, she married Harlan E. “Gene” Hiett in Monmouth, Illinois, and he preceded her in death on February 26, 2014. Genevieve was a longtime member of the United Methodist Church; in Monmouth, Marshalltown and Clinton, Iowa. She was active in many areas of the church, but her primary interests were United Methodist Women and Missions. In retirement, Genevieve and Gene were involved in NOMADS, a group dedicated to providing volunteer labor for United Methodist Church organizations. Genevieve is survived by two daughters, Cynthia (Michael) Porter, of Menasha, Wisconsin; and Diana Gay (Timothy) Nichols, of Wichita, Kansas; two sons, Thomas (Candy Smith) Hiett, of Monmouth, Illinois; and John (Mary Adams) Hiett, of Iowa City, Iowa; two sisters, Virginia Carlson, of Galesburg, Illinois; and Joan Beasley, of Quincy, Illinois; and one daughter-in-law, Karen Higgins, of Phoenix, Arizona. She is also survived by several grandchildren, great-grandchildren, nieces and nephews. Genevieve was preceded in death by her parents; husband; infant daughter, Amy; son, Andrew and daughter-in-law, Peggy Hiett. As were Genevieve’s wishes, cremation is being accorded. A memorial service will be held in Monmouth, Illinois, at a later date. Interment will be in Berwick Cemetery. In lieu of flowers, memorials may be left to the United Methodist Churches of Monmouth, Illinois, Clinton, Iowa, or Marshalltown, Iowa; the Clinton Women’s Club; or to a charity of the donor’s choice. Genevieve’s family would like to thank the staff at Courtyard Estates, Roseville Rehab & Health Care, and OSF Hospice for their exceptional care. For more information, or to leave a remembrance, please visit www.turnbullfuneralhomes.com.